Explanation: 3C175 is not only a quasar, it is a galaxy-fueled particle cannon. Visible as the central dot is quasar 3C175, the active center of a galaxy so distant that the light we see from it was emitted when the Earth was just forming. 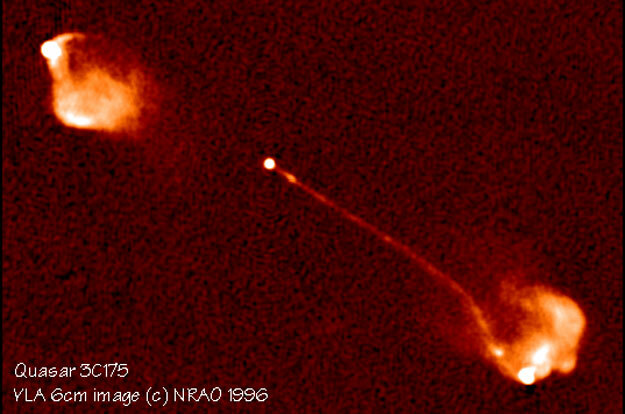 The above image was recorded in radio waves by an array of house-sized telescopes called the Very Large Array (VLA). Shooting out from 3C175 is a thin jet of protons and electrons traveling near the speed of light that is over one million light-years long. The jet acts like a particle cannon and bores through gas cloud in its path. How this jet forms and why it is so narrow remain topics of current research.